The Engineering for Minecrafters series is designed to encourage creativity and problem-solving skills in kids who love building in Minecraft. Each book helps players work within the physics of the game to build clever farms, ultra-efficient railways, automated redstone-fueled contraptions, and more. Minecrafter Engineer: Must-Have Starter Farms is the first in this compelling and inspiring new series. Guided by hundreds of in-game, step-by-step photos, and simple instructions, kids will learn how to engineer one of seven spectacular farms to yield resources and goodies beyond their wildest dreams. Stacks of sugarcanes, gobs of gold, and bushels of blaze rods are the rewards that await them when they follow the techniques laid out in this book. Helps encourage creativity and problem-solving skills. They’re not an expert gamer until they learn the tricks and tips in this book! 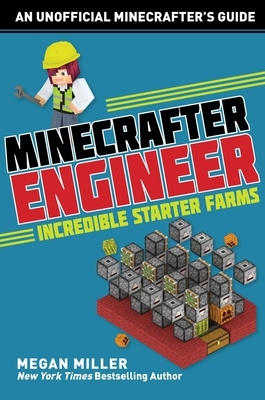 Minecrafter Engineer: Must-Have Starter Farms holds the valuable secrets to becoming the Minecrafter engineer they’ve always wanted to be.